I was a professional musician for most of my life until the day I entered a CROP CIRCLE in the UK & laid down in the center of it. I felt a presence & saw things I had never seen before. I wasn't alone! I shot over 1,100 incredible Crop Circle photos that summer, then hired a UK film crew to shoot the interviews. I crawled around the Crop Circles every day & photographed them from Microlight airplanes once a week. We flew 2,000' over the Crop Circles in rainy windy weather with no doors on. That was NOT my usual style! I interviewed the most passionate well informed researchers & their stories are truly a Wake Up Call for humanity! Every day was a treasure hunt & every night a mystery. We spent late nights on the hillsides watching the skies, hoping to see the Balls of Light that seem to be creating the real Crop Circles. We were chilled to the bone, but unable to leave. How can the world continue to overlook these incredible mandalas year after year? They are the first physical manifestation of communications from other realms that humans can actually see! Researchers concur that Crop Circles offer subliminal information that enhances the viewer & lasts a lifetime. There's no doubt in my mind this is true! "I have read a number of books on crop circles and seen most of the highly recommended films on the subject, of which "THE WAKE UP CALL ~ ANYBODY LISTENING?" is the best. Having attended the 2005 Crop Circle Symposium in Glastonbury, England and visited first hand numerous crop circles and listened to many authorities lecture on this phenomena, I have two conclusions: First, I believe that anyone who looks into the crop circle phenomena with an open mind will be convinced that they are manifestations of some intelligence or power beyond human capability. The claims that these majestic mandalas in the fields are man made are beyond absurd in the face of the documented evidence and personal testimonies to the contrary. Which leads to my second conclusion: "The Wake Up Call ~ Anybody Listening?" 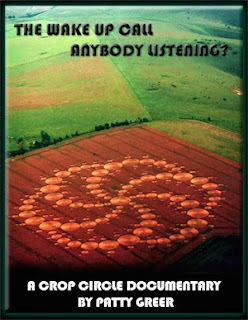 is by far the best documentary film on crop circles to date. Kudos to you Patty Greer for making the most informative, inspiring and beautifully crafted movie on this mind blowing subject of Crop Circles." "Patty Greer’s inspired film, “The Wake Up Call ~ Anybody Listening?” is truly a journey of ego-less wonder and the embracing of wisdom and collective experience in the crop fields of England. In her truly feminine and gentle way, she explores the magic of what is unfolding before our eyes, if only we will see. See this film, open your heart, and fill your soul with all that is possible at this incredible time of Starseed Awakening."